If you work in retail sales and service, it's very unlikely that you will get weekends off on a regular basis. But Kent and I have done the next best thing, which is to arrange to take the same two days off every week, so our much anticipated “virtual weekend” is Wednesday/Thursday. Our anniversary fell on a Thursday this year, so we made plans to leave on Tuesday afternoon (virtual Friday) after I got off work for a celebratory three-day bike tour. Our plan was to put the bikes on Sound Transit 554 to Seattle, take the 3:00 ferry to Bremerton and camp at Illahee State Park about four miles northeast of Bremerton, then on Wednesday ride around to Poulsbo and across the bridge to Bainbridge Island, where we would camp at Fay Bainbridge Park Wednesday night. We would then head into Winslow on Thursday, eventually taking the ferry back to Seattle and the bus home. This is more or less what we did, but it's not as simple as it sounds. Permit me to explain. The bus ride to Seattle and the ferry ride to Bremerton go as planned, but no sooner do we get off the ferry than we are met with orange signs, road construction projects, and a detour. The bridge we had intended to go over is apparently closed. While we stop to puzzle over the map and make a new plan, one of the locals kindly informs us that the bridge is not closed to bicycles, so we are able to walk through the roadblock and over the bridge through the construction, with me chanting my “Don't look down” mantra all the way across. We ride through the residential part of Bremerton on a road marked as part of the Mosquito Fleet Trail. This is a pathway designed to provide a continuous network of trail corridor for bicyclists and pedestrians that skirts the eastern shoreline beginning at the Kingston ferry terminal and ending at the Southworth ferry terminal, connecting all of Kitsap county's cities, seventeen communities, schools, parks, open space, public areas, and 24 historic Mosquito Fleet docks. It's currently a mix of shared road, road with paved shoulder, bicycle lanes, and shared sidewalk. I'm riding with plenty of gears, thank the Lord, but I can still vouch for the “challenging climbs” part. Bremerton is extremely hilly, and my low gear is getting a great workout on this tour, as are my feet when I occasionally get off and push my bike upward. As we pass through Bremerton towards Illahee, I imagine that all this climbing must surely give way at some point to flat terrain or even one of those “thrilling descents,” but as we climb, and climb, and climb, I decide this must be wrong and that we are, in fact, on The Hill That Goes Up Forever. We are looking eagerly for a sign for Illahee State Park, but do not see one. However, an amazing thing finally happens, and The Hill That Goes Up Forever turns, at long last, into The Hill That Goes Down Forever. We coast down, and down, and down, and even though it's a nice change of pace from climbing, the thrill is overshadowed for me by beginnings of concern that we have somehow gone past the park. By the time we pass signs for Brownsville, cross a bridge, and come to a marina, Kent is sharing my concern. We have gone too far north on this road. I really, really want to believe this. The sun is setting, the daylight is fading rapidly, and the air is getting chilly. I have been up since 3:15 this morning and put in a full day of work, taken a bus and a ferry, and ridden quite a bit further than I intended to, and I am eager to find this park and set up camp. So as we continue riding and it becomes clear that our journey along this road is showing absolutely no sign at all of leading us to any park, I am not a happy camper. That is to say, I am not a camper at all yet because we have basically gone around in what I suspect is something close to a big, extremely hilly, circle, and it is nearly dark, and we have not yet found the campground. Kent, despite a better sense of direction and a lot more navigating practice, is as baffled as I am as to where it could possibly be. Someone recently suggested online that if you can't find a place to camp, you can set up your tent and put up an “OCCUPY (WHEREVER)” sign and you will look like part of a bona fide political protest. I laughed at the time, but I am starting to look at fields, woods, and parking lots at the side of the road with an appraising eye, because I am just about ready to occupy something and hope we don't get arrested. I truly respect private property and would never intentionally trespass, but I am extremely tired and I am hoping to sleep somewhere tonight at some point. If we couldn't find the park in daylight, how are we going to find it in the dark? The Washington State Park website says “Illahee” means “earth“ or “country” in the native tradition, but I suspect that what it really means is “secret place well-hidden from bicycle tourists,” or maybe “park lost in time warp.” So when we spot a lady walking her dog on the other side of the road, I do something truly desperate, something I fear will embarrass my husband no end because it is The Thing Guys Never Do. I stop and ask for directions. “Excuse me,” I call out to her across the road. “Can you tell us how to get to Illahee State Park from here?" Happily, Kent does not ride on past pretending that he doesn't know me. The lady assures us that we are going in the right direction, though we still have a ways to go. “You stay on this road until it turns into Illahee, and you'll go up a hill,” she says. She continues with concise, helpful directions involving a fire station on the right and a left turn towards the water to which we both listen carefully. We thank her and get back on the road, which does indeed turn into – drum roll, please – the Illahee Road that we were on nearly two hours ago. And we are indeed going up a hill. That “thrilling descent” that we enjoyed much earlier has now, depressingly, morphed into its alterego, the “challenging climb.” But it's heartening to know we're going in the right direction and even better to have a landmark to look for. It's completely dark by now, but at long last the yellow sign for the fire station shows up in the darkness, and we cross to take the left turn. It's at this point that we realize why we never saw a sign for the park. The sign is on the corner, but it has quite literally fallen down on the job, and quite naturally, we weren't looking for it in a clump of bushes at ground level! We also realize that our Kitsap County Bike Map, useful as it is for finding bike routes, lacks sufficient detail to find anything off the routes, and shows the park to the west of Illahee road, when it is in fact situated to the east of it. Tired as we are, the collapsed sign is too good a photo op to miss. Kent takes a picture, and we finally finally follow the road down into Illahee State Park, climb yet another big hill to the campground, and ride into the first site we find. It isn't actually all that late, but it is pitch dark in the woods, so we leave the bike headlights on. Kent goes to register, and I dig out the tent and begin to set it up. 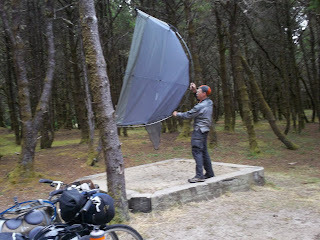 When Kent returns, we finish putting up the tent and use a small light to collect fuel for the Kelly Kettle. I dig out mattresses and sleeping bags while Kent cooks our dinner of Mountain House Beef Stroganoff and boils water for coffee and cocoa. We eat by the romantic light of two little tea candles and are soon settled in for the night. When we awaken, we find the sun rising through a green forest of tall evergreens and enormous ferns. The park is beautiful, and except for the hosts, we seem to be the only ones here. We fire up the Kelly Kettle for coffee and cocoa, and dig out bagels, sausage, and cheese for breakfast. While we are eating, a squirrel stops and eyes us curiously. Kent lures him over with a couple of Peanut M&Ms. The little fellow is cautious at first, but after one taste, he's completely hooked. Kent gives him a couple more M&Ms, and I offer up a walnut from my trail mix, but eventually we decide that enough is enough and it's time to explore the park. We're walking away from our site when I turn back for the satchel that sits in my bike basket, uneasy about leaving my ID and bank cards unattended. And as I approach our campsite, I notice a small bushy tail hanging over the edge of our food pannier. “You!” I exclaim indignantly, startling the squirrel. “Repaying our generosity with theft!” The furry little culprit takes off in a hurry. I'm mostly amused, especially since all the food is actually still there, unnibbled by Bushytail. I seal up the pannier and secure it inside the tent before grabbing my satchel and heading back to explore the park with my husband. The wooded campsites are beautiful. Eventually we hop on our bikes to explore further, riding through the forest to a couple of nice group shelters, and into a clearing with a great view of the water. We contemplate riding down the steep hill to the shore, but the thought of having to climb back up inspires us to be content with the view. I mean, going down a big hill and having to turn around and climb all the way back up? Haven't we been there, done that? Like, just last night? 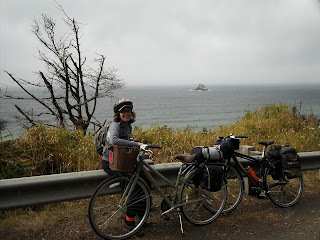 We ride back to camp, pack up, and are soon on the road again, retracing the route we took yesterday, then moving on to further “challenging climbs,” “thrilling descents,” and even some “spectacular vistas” on the roads toward Poulsbo. It's a beautiful day to ride, cool and sunny. The trees are amazing shades of green, rust, gold, and deep plum with occasional stunning flashes of fiery red. Sunlight sparkles on cold dark blue water as we ride along the shore of Liberty Bay. Poulsbo is a wonderful and welcoming small town with bike lanes on its roads and an abundance of bookstores, bakeries, and small shops. The blue and white “Velkommen til Poulsbo” sign, the Norwegian flag hanging from an upstairs window, the colorful Viking ship mural on the side of a building, and shop windows featuring gnomes and other Scandinavian memorabilia attest to the town's pride in its Norwegian heritage. I love books and bakeries and I am Norwegian by marriage, so I quickly decide that this is my kind of town. We lock up our bikes and wander around, stopping for lunch at an espresso place called “Cups.” Before leaving, we stop at Sluys Bakery to stock up on goodies for my bike basket. Sluys Bakery is home to the famous Poulsbo bread. Family owned and operated since 1966, they proudly “continue the tradition of baking the way grandma used to.” The display of pastries and cookies in the large front window is mouth-wateringly amazing, and the aroma inside heavenly. A crowd has gathered around the cases, and I take my place in line while Kent waits outside. On the wall is crafted “Giv os idag vort daglige brod” (“Give us Lord our daily bread”), and I smile to see this line of a familiar prayer so appropriately and artistically displayed. A few minutes later, I leave with a small bag containing a butterhorn, a cinnamon twist, two “Trollhouse” cookies, and two Halloween cookies. We retrieve our bikes and are on our way out of town, heading for Fay Bainbridge Park. Between us and Bainbridge Island, however, is the Long and Dreadful Bridge. Actually, it's called the Agate Bridge, but bridges creep me out and in my mind this one is long and dreadful, and given its proximity to “Little Norway” I would not be at all surprised if there were trolls lurking under it, too. Happily there is a sidewalk, and not a troll in sight, so we walk the bikes across. It's extremely windy up there; at times I'm struggling to keep myself and the bike upright, fearful of falling over into the oncoming traffic. But eventually we make it safely across, get back on the bikes, and continue onto Bainbridge Island. This time Kent knows the way to Fay Bainbridge Park, having camped there on a previous trip, so we do not get lost and are able to arrive in daylight. There is “tent only” camping in the upper part of the park, but we ride down to the beach and decide we're willing to pay the higher fee to camp down there by the water. It's very beautiful and peaceful, and we choose a site with overhanging trees that offer a sheltered space to set up our tent. Kent is the expert camper, but in our adventures together I have learned bit by bit to make myself useful. We've settled into a good rhythm for turning a campsite into a temporary home, going about our ritual tent raising, unpacking, and fuel gathering with quiet joy in the beauty around us and one another's company. There is plenty of daylight left to walk on the beach, and we wander along the shore hand in hand for awhile. On returning to camp, we boil water and open up the bakery bag. I savor the butterhorn with tea while Kent munches on a Trollhouse cookie with coffee. We decide we're really not that hungry for a hot meal tonight, so I break out the sausage and cheese to munch on as well. While we are eating, a couple of deer wander by and disappear into the woods. We return to the beach as darkness is falling. Across the water, the lights of Seattle, Edmonds, and Everett glow through the mist like a distant ring of shining jewels. 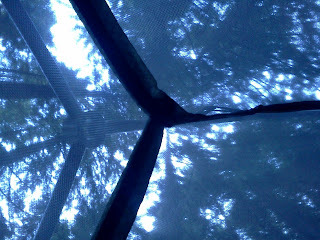 The air is damp and the cloudy sky hints of rain, and eventually we return to the cozy warmth of our tent and sleeping bags. During the night, the rain begins to fall. We have never actually camped in our Big Agnes Seedhouse SL2 in the rain before, but it passes the test with flying colors. We stay snug and dry and warm as we fall asleep again, listening to the rain. By morning, the rain has receded to a drizzly mist. We fire up the Kelly Kettle, enjoying its cheerful flame as it boils water for our breakfast. While we are boiling (Kent is fond of showing off the Kelly Kettle to curious visitors and explaining, “We don't cook; we boil”), the park attendant drives up in his truck. He explains that they only charge $5 for each bike and that he is giving us a partial refund for the full site fee we paid yesterday. He adds that he hopes we'll come back, and that they will always find a spot for hikers and bikers even if the sites are full. He's curious about the Kelly Kettle, giving Kent another opportunity to expound on its many fine features before he returns to his truck. We decide we're now hungry for the Mountain House dinner that we didn't eat last night. We take that, our thermoses, and food pannier over to the group shelter to enjoy our anniversary breakfast out of the drizzle. Hot Chicken and Noodles and hot drinks hit the spot on this chilly, damp morning. The cinnamon twist and another cookie complete the feast, fortifying us to break camp and head out on the rainy road. While riding in the rain isn't my first choice, it's not so bad if one is dressed for it. Our Patagonia TorrentShells do a good job of keeping the upper parts of us dry, and our lightweight nylon pants shed water pretty well. (We have rain pants, but it doesn't seem to be raining hard enough to justify putting them on, and I'm working hard enough on all these “challenging climbs” that an extra layer of weight and warmth on my legs is unappealing.) I normally have a hard time finding pants that fit comfortably, but I like my Mountain Hardwear Yuma Convertible pants so well that I bought two pairs and wear them most of the time whether I'm riding or not. Keen Newport sandals and wool socks are a winning footwear combination for us in wet weather. Wool insulates even when wet, and the socks dry much faster in sandals than they would in shoes. Arriving in Winslow, we make our way around more road construction and over to Classic Cycle, the old home of my Trek Allant whose purchase is related in an earlier post. We look around the shop, chat with Jaime a bit, and leave with Classic Cycle caps, an anniversary present to each other. We wander along the Waterfront Trail to Pegasus for coffee and cocoa, then head for the ferry. The ferry ride is peaceful and pleasant, and we are soon back in Seattle, heading up the hill to the bus stop. Once again the bikes are on the bus, and we are on our way home to Issaquah. Later on, over a candlelight dinner at one of our favorite restaurants, we'll talk over the wonderful adventure we had in this hilly and beautiful part of the world, and the wonderful 27 years we've shared with each other, and look forward with love and joy and great anticipation to the years and adventures to come. Not Turtle Enough For Your Turtle Club? Years ago, hell decades ago, when I was in elementary school, I took a test. I only remember one question from that test and I remember it because I got it wrong. The question showed a picture of a crayon that was broken into two pieces with the caption "The crayon is broken in half" with check boxes for TRUE or FALSE. I checked TRUE only to have it later explained to me, that the two pieces of the crayon were of different sizes. The crayon was broken in TWO, but it wasn't broken in HALF. At the time I thought the question was needlessly tricky and while it enraged my elementary sense of justice, I now see that single question as a pivot point in my education. While I still think the most valuable lesson I took from that day was an enhanced suspicion of authority figures, it was also the time when I truly saw the power of words. We can't talk about mathematics without talking. While in conversation we might say a crayon is broken in half, that is only mathematically true if it is broken into two perfectly equal pieces. We can only accurately say that the crayon is broken in two. I mention the broken crayon because I want to question the language which has grown up around a couple of trends in the world of bicycles: The Slow Bicycle Movement and the somewhat related Cargo Bike Movement. While I think that we are at a wonderful point in the history of bicycling, where a wide variety of bicycles are available and we have reached the point where bike shops and customers are realizing that bicycles can be used for more than racing in France and looking like Lance, I worry that some genuine enthusiasm has tipped over into unintended exclusivity. Words and actions carry meaning and sometimes the message we think we are sending is not the one that is seen or heard. First off, I think the biggest problem with the Slow Bicycle Movement is its use of the word slow. Now this may sound odd coming from a self-proclaimed Mountain Turtle, a man who rides with his wife as part of Team Turtle and someone who has often advised folks to Hasten Slowly, but there is a difference between not having to go fast and being slow. I work in a bike shop and I can tell you that very, very few people come into a shop saying "could you please show me something that is very slow and heavy?" They may not be interested in racing but slow is not a good sales word. "Comfortable" is a good word, as is "practical", "efficient" or "well-suited". But "Slow" is not great word to use in the shop setting. Not only does "Slow" turn off those seeking an expand their cycling experience beyond racing, it also does little to encourage the pedestrian to become a cyclist. The pedestrian is already comfortably slow without the complication of extra machinery. If a bicycle is to appeal to the pedestrian, it must rationally deliver a promise of some increased speed or comfort. You can deliver the message that riding to work is not riding the Tour deFrance without making the leap to a bicycle that is as massively overbuilt for daily use as a typical American SUV. The SUV of the bicycle world is the cargo bike and I have no complaints that cargo bikes exist. I have many friends who own and sell cargo bikes, who live happy, car-free lives thanks to cargo bikes and that's all well and good. But when those same well-meaning friends insist that my life would be so much better if I had a cargo bike and that then I could do those Costco runs and haul 150 pounds of dog food home, I think that maybe one size doesn't fit all. I'm still pretty happy not going to Costco and sticking with bikes that I can haul up the stairs to my second floor walk-up apartment. We have to be careful not to tell people that they are not turtle enough for our turtle club. While it's great to say that you don't need special clothes to ride a bicycle, often that message is eclipsed by the powerful images presented by Tweed Rides and Copenhagen Cycle Chic. As my wife recently commented to me after reading the latest issue of Momentum Magazine, "I don't know if I'm fashionable enough for biking slow." I'm not asking for people to give up their cargo bikes or stop dressing snappy if that's the way they roll. But the wonder of our time is that we have all these options available to us and they are just that: options. Lycra is not needed, neither is tweed. Your bike can be carbon or steel, aluminum or titanium. Your tires can be skinny of fat or somewhere in between. Cargo bikes can haul lots of cargo but any bike can haul something. And some of those lightweight bikes, they really haul. One size may not fit all, but there are many sizes and types of bikes out there and they fit many. If you know somebody, big or small, who doesn't know how to ride a bike, I have some advice for you. This is not original advice, but I like to think that's what makes it good advice. It's the sum of what I've learned in working with people, big and small, watching them wobble and doubt and become bike riders. Step one: Forget the words "It's Easy." It's not. Not for the person who doesn't know. It's hard. Remember when you learned to walk? No, you don't (unless you've got a really, really good memory). You were a tiny kid and a lot of your brain had to get engaged in the work of learning to balance and move your legs and shift your weight and all of that. You learned by trial and error. That's not easy. It involves trials. It involves errors. But babies do learn to walk. That doesn't mean it's easy, that just means it can be done. Step two: Kindle desire. 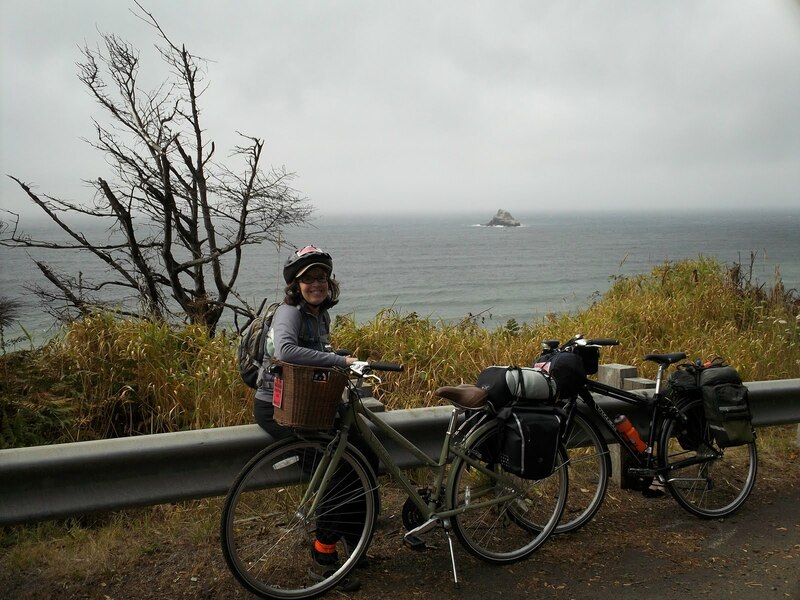 While it is important not to minimize the effort involved in learning to ride a bike, it is at least as important to the joy to be found in two wheeled travel. The slim volume Franklin Rides a Bike does a great job of explaining to anyone, regardless of age, that while learning to ride bike is a challenge, riding a bike is great fun. Step three: Don't use training wheels. 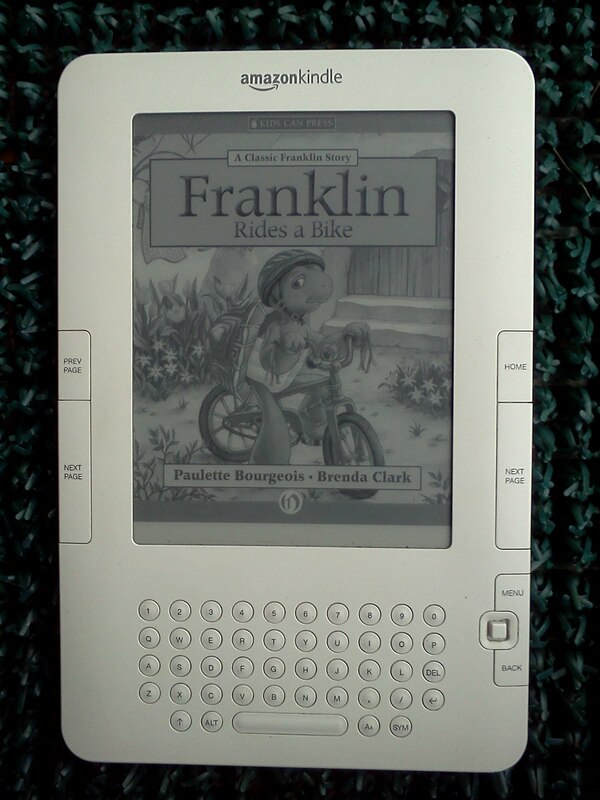 The main action in Franklin Rides a Bike involves Franklin ditching his training wheels. Training wheels actually inhibit acquiring the key balancing skill required to ride a two-wheeler. The techniques described there work well David has done an awesome job of explaining things. Riding a bicycle is a wonderful thing and learning to ride is a once in lifetime milestone. While the many of the joys of travel come with the motion of it all, the wonders revealed beyond the next bend in the road, great satisfaction is also found in stopping, declaring "this is the place" (at least for this night) and staking a claim on a small piece of earth. While a tarp, bivy or a blanket of stars may be enough for the most minimalist of trips, a good tent is a haven. A few pounds of mesh, fabric and poles become a bit of home at the end of a long day. When the world seems too wide, the wind too biting, the rain too much, the tent is where you rest, reflect and recharge. Tomorrow you pack it up and move on again. 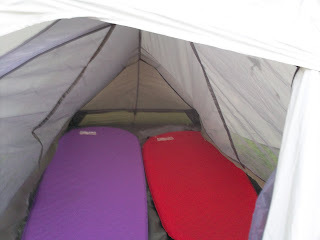 Christine and I are compact people who like each other and we find our Big Agnes Seedhouse SL-2 to be ideal for our needs. The Seedhouse is very light (a bit over three pounds) and it packs small. 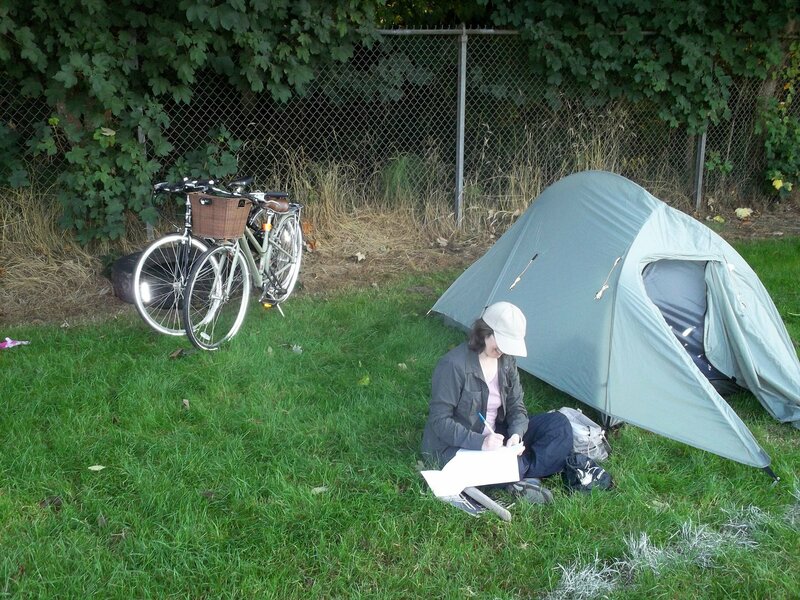 In the picture below, the tent is strapped to my bike's rack above the panniers and underneath the U-lock and cable. The main body of the Seedhouse is mesh and we've pitched it without the fly on summer nights when our only concern is protection from bugs. The Seedhouse is free standing and the mesh body clips to a shock-corded frame. The frame is a series of short aluminum tubes permanently connected by shock-cords and it basically self-deploys when you unfold it. Unlike some other tents I've owned, there is no threading of tubes through narrow nylon sleeves and no loose parts to lose. Another advantage of a free-standing dome-type tent like the Seedhouse is that you can pick the whole thing up to move it or to shake out any dirt you may have tracked into the tent. Because the tent is free-standing, it doesn't strictly need to be staked out but because silnylon is a slippery material and the tent is light, wind or a less than perfectly level surface can result in unintended tent migration, so staking the tent down is a good idea. 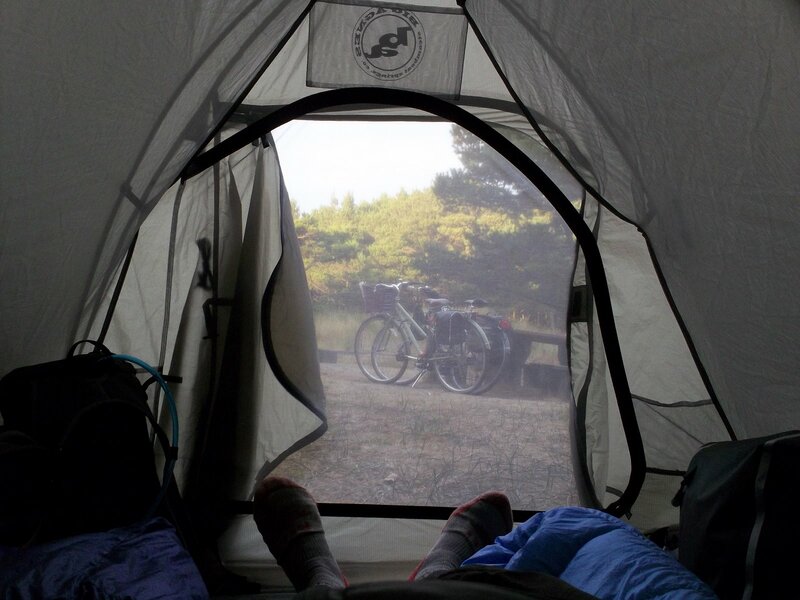 Christine recounts the excitement of waking up in a moving tent in our Journey to Wood Creek. The Seedhouse SL-2 is a small tent, with plenty of room for one person and enough room for two people to be cozy. The tent is just wide enough for two Therm-a-Rest pads (or people) to fit side by side (some campers may prefer to sleep head to toe). There is a bit of room for gear inside the tent and the staked out vestibule is a big enough dry zone to store packs or panniers. Campers who want a bit more space should check out some of the larger tents made by Big Agnes or the slightly larger, slightly heavier and very well-regarded MSR Hubba Hubba . 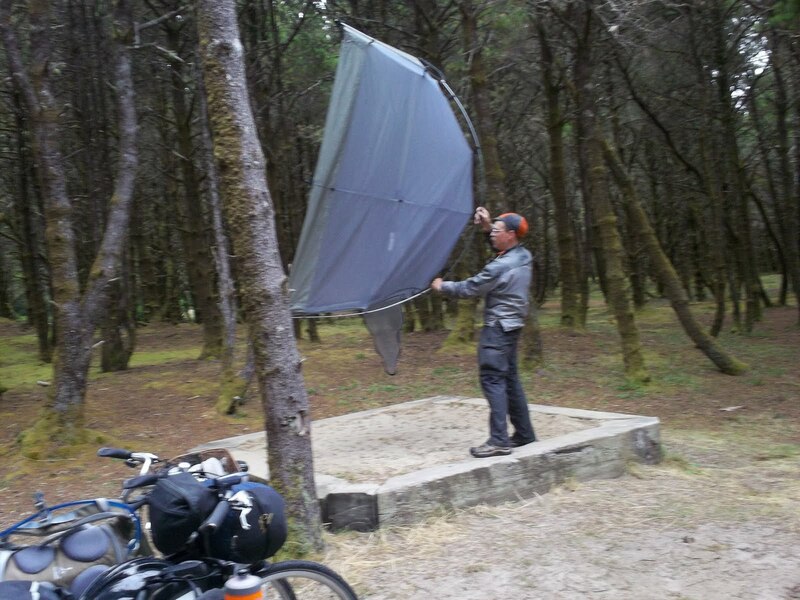 Whatever tent you get, get one that sets up quickly and easily, gives good protection from bugs and rain, is big enough for your needs and is no heavier than it needs to be. For Mr. and Mrs. Mountain Turtle, that tent is a Big Agnes Seedhous SL-2.